As I was tidying up the girls' room today, putting away the abundant stuffed animals, I thought it might be fun to do a Flashback Friday post with a small selection of the handmade toys I've made for my girls over the past several years. 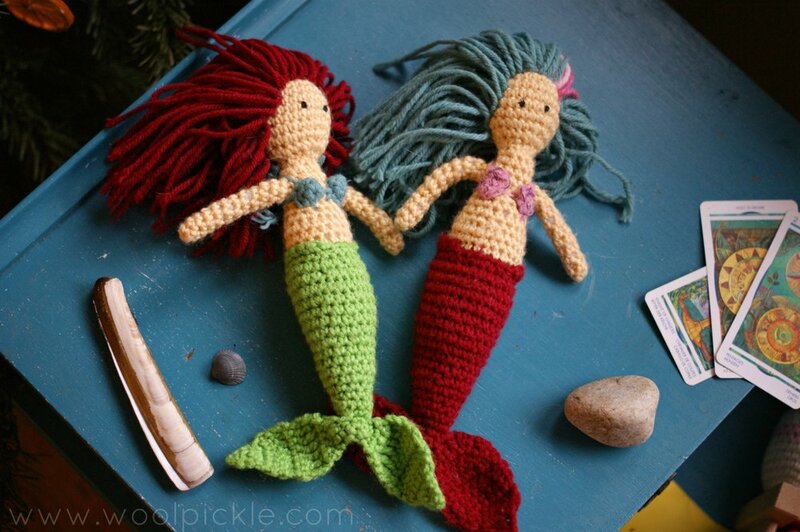 The blue and maroon haired mermaids are from a time when I was just learning to crochet, five years ago in Hawaii. It was too hot for crochet garments or blankets so I turned my eye to amigurumi. Handmade things are a time capsule of not only a moment in time, but of a step along the journey of a single person's craft. Loose holes and uneven gauge remind me of a time when I was just learning to hold yarn and hook and develop my own patterns. The third mermaid was made shortly after my daughter was born (and if there's interest, I did write a pattern for it. Perhaps I'll post it if enough people ask.) These toys don't get as much play anymore, but you can see in their dog-haired bodies and chewed up limbs that a baby girl loved them quite sincerely for a little while. The bunnies are still some of my favorite toys. The little shoes, the beady eyes, the stripes that have now, unfortunately, bled into the white cotton. The big bunny still finds his way into the arms of my biggest girl while she's sleeping (now that I trust she is old enough not to choke on the buttons overnight.) and the littlest bunny has a rattle inside that my youngest likes to bat around. These patterns are my own devising, though I was inspired by the work of The Humble Earth on Etsy (where you can buy crochet patterns for the most adorable, stripey bunnies). I like to wonder whether my children will look back on these toys when they're older and be inspired. Maybe they'll look at them and feel some tug of nostalgia or they'll laugh at how worn they toys are from chewing. I hope that at least the love that was put into the making of these will find a way to be absorbed, as if by osmosis, into my childrens' hearts as they play and sleep. I think that's a universal hope among us crafters and makers, isn't it?